As the orange sun disappears over the Amazon River our boat makes its way slowly back to the lodge after a day exploring the river. Pink dolphins splash, blue and yellow macaws screech from the rainforest trees and squirrel monkeys squabble over a position on a branch as they settle for the night. From Iquitos, we travel to Amazon Yarapa River Lodge, a remote eco-lodge on the Yarapa River, a pristine tributary of the Amazon River. It is a two-hour drive to the town of Nauta. Here a boat takes us far up the Amazon River and eventually Yarapa River. The total trip from Iquitos takes about 4 hours. Pink dolphins splash around and jump out of the water and it’s not until we see them up close we realise how big they are. On the Amazon River, the birdlife is immense and only improves on the Yarapa River. It is a bird lover’s utopia. 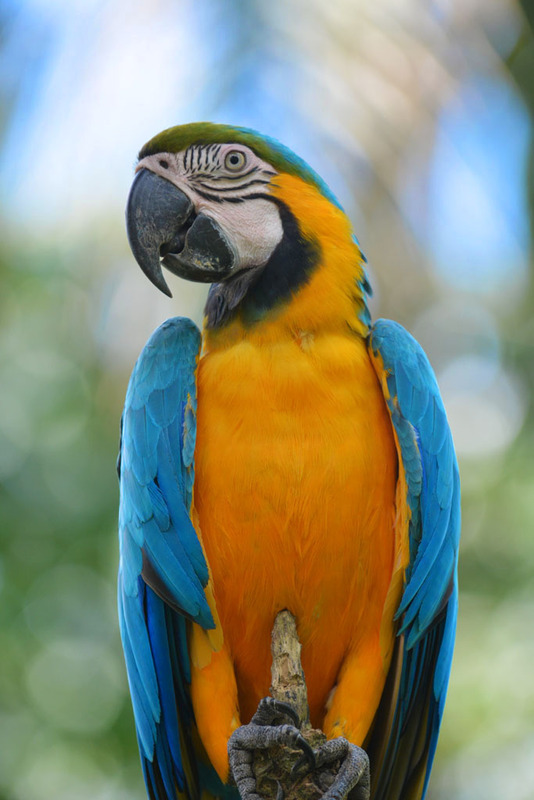 Blue and yellow macaws and little blue-winged macaws, Amazon kingfishers, toucans, herons, hawks, eagles and woodpeckers to name a few. Upon arrival at the lodge, Jorge our guide, Ruben our chef and Angelo one of the lodge staff meet us. We have a welcome drink and the first of many simple but delicious meals inspired by the local cuisine. Ruben puts so much effort into the meals and even though the vegetarian food isn’t that common on the Amazon River, he puts together some scrumptious and tasty meals. All dietary requirements are catered for, and guests can request their favourite food and meals. 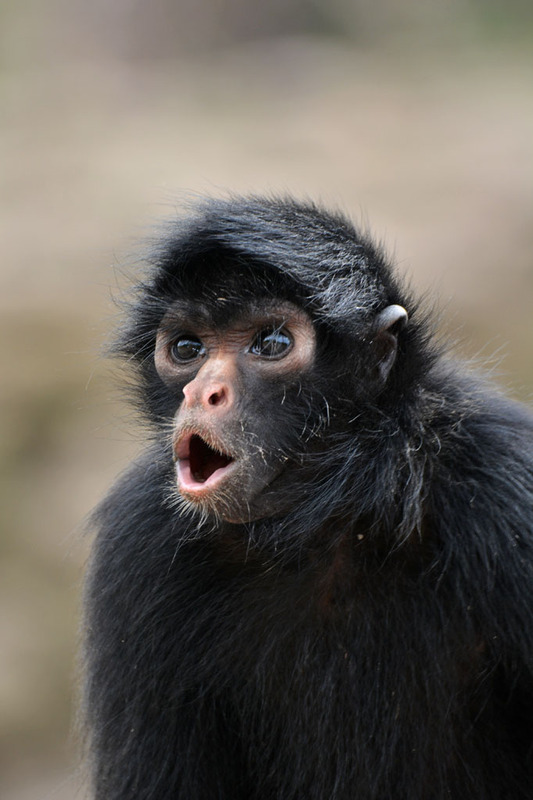 Eduardo the spider monkey shows so much expression. Built using local materials and concepts, the lodge is rustic and comfortable. Roofs are thatched which provides a natural cooling system and the lodge is run on solar power. 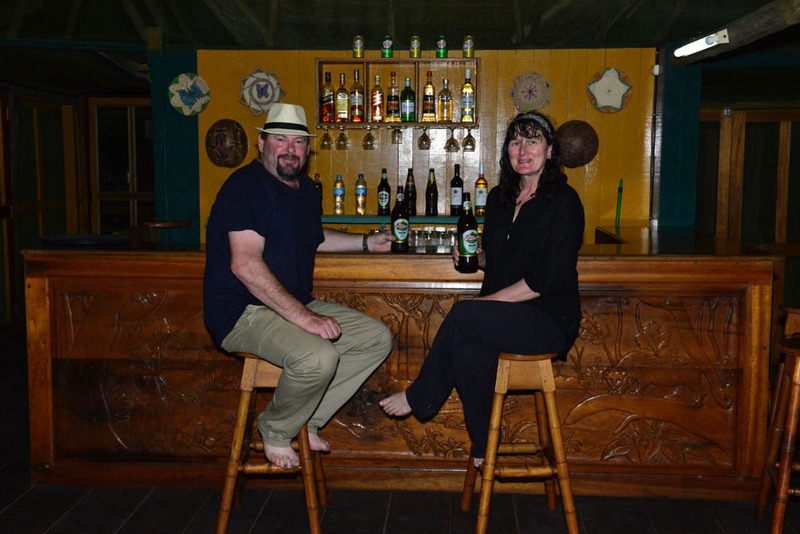 The wooden furniture is hand-carved by locals and the beds in the huge bedrooms and the bar in the restaurant are extravagantly carved portraying wildlife and local culture. We meet the local wildlife and the most adorable group of resident monkeys at Yarapa. 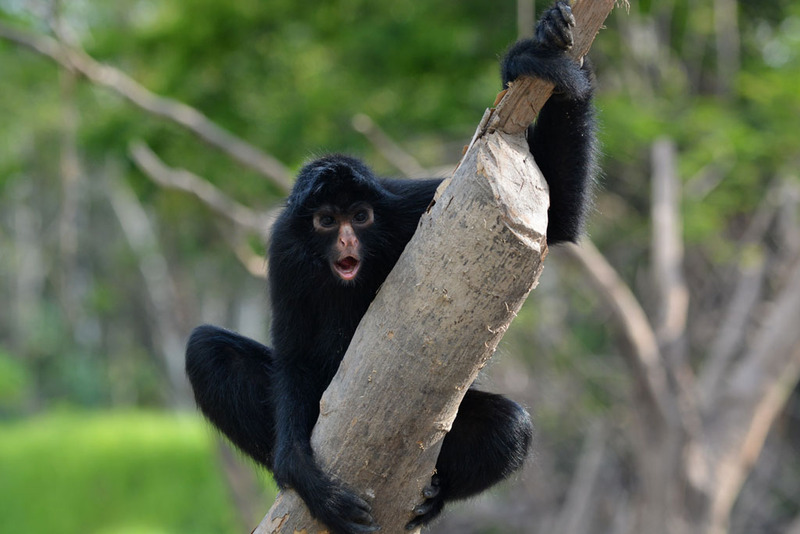 There is no need for an alarm because Shebaca the resident howler monkey wakes us every morning at 6.00 am. 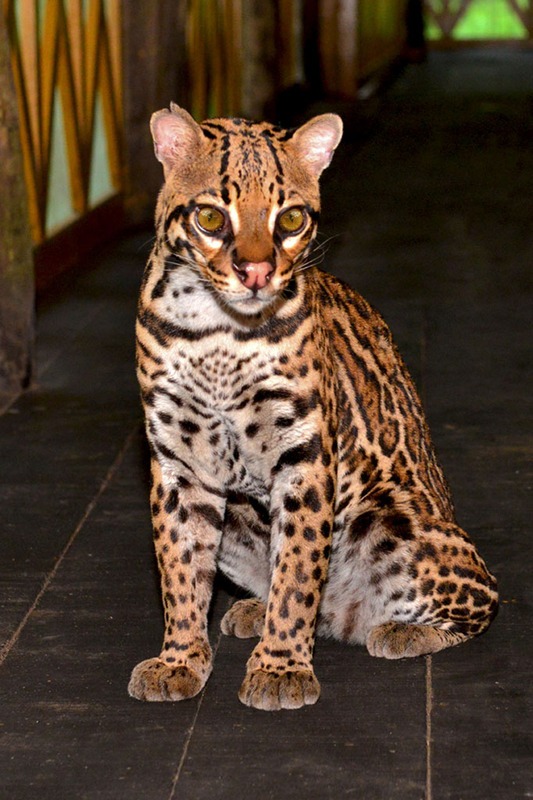 It’s a loud guttural sound and carries up to a distance of 5 km in the jungle. 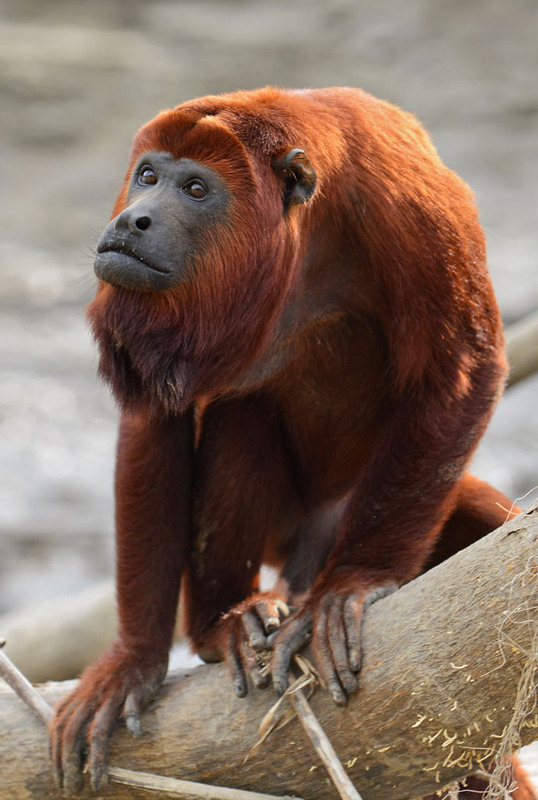 Howler monkeys make this noise in the morning and at night to check out where their competitors are. 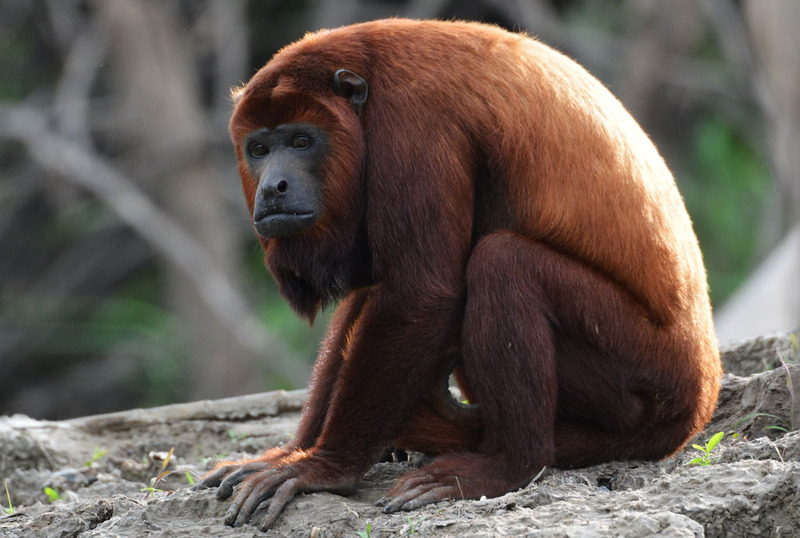 Shebaca the howler monkey wakes us every morning. 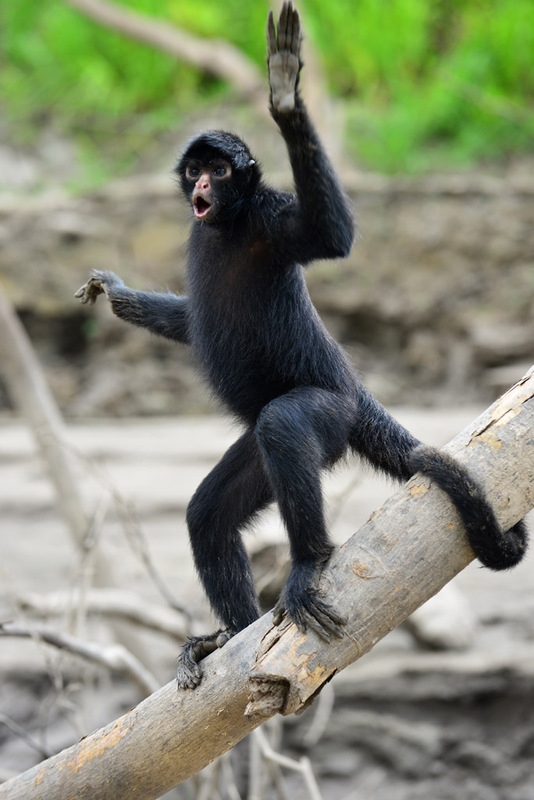 Shebaca is a rescue monkey and is best friends with Eduardo the spider monkey. The unlikely pair share a strong bond and adore each other. The rescue monkeys are free to come and go as they please and love human company. Eduardo is full of personality. 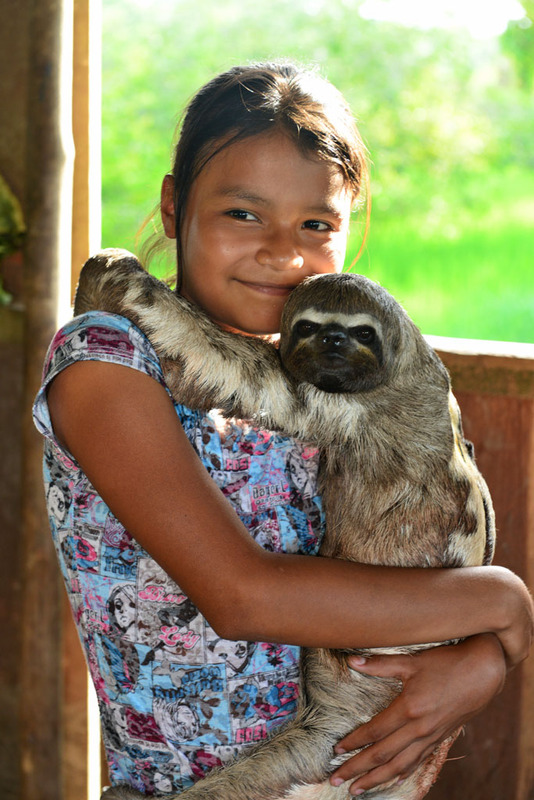 We visit local villages, meet Pablo the local sloth, hike in the rainforest, river cruise in a little traditional boat, look for birds and primates and learn about the medicinal plants. Though not a close sighting we see a sloth high in a tree and it’s a good feeling to see them in wild. 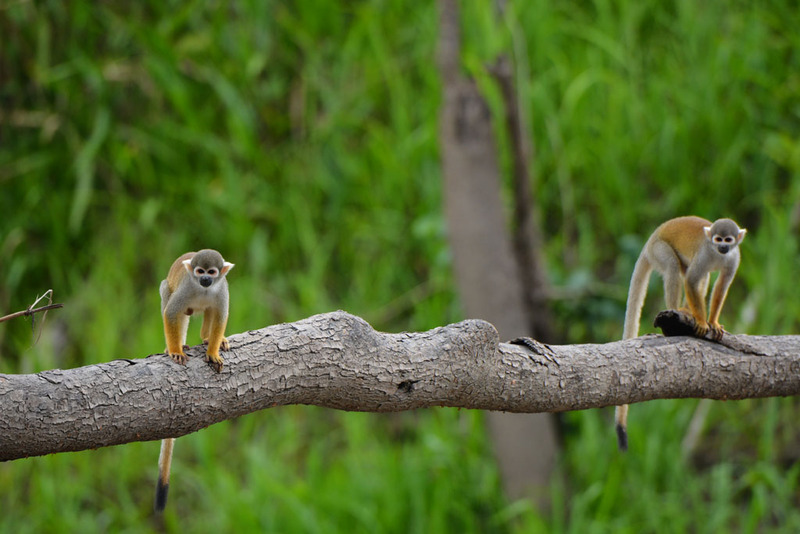 Squirrel monkeys, one of the smallest primates and white-fronted and brown capuchin monkeys play on the riverbank and we watch them from our boat. 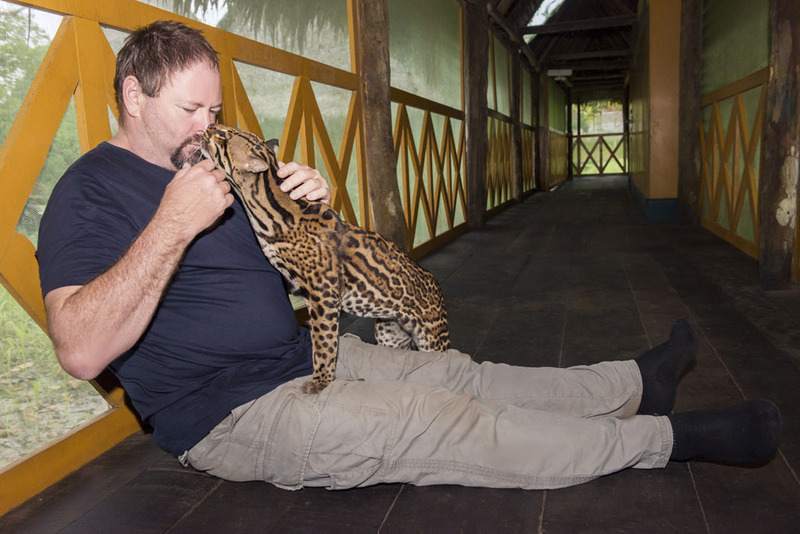 At night we meet Simba, a rescued ocelot, also known as the dwarf leopard. The lodge has raised her from a baby and she is free to come and go as she pleases. Simba spends her days out in the jungle and regularly returns. Sleek and adorable, with a dappled coat she has huge yellow eyes. She has a few battle scars and Jorge tells us she has all the boys in the jungle after her. 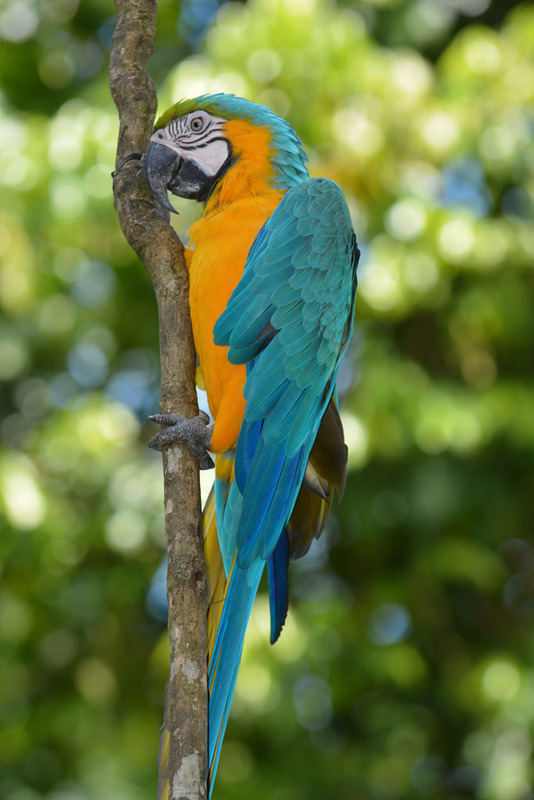 The activities at Yarapa are flexible and tailored to the guest’s interests; whether its bird watching, searching for pink dolphins, visiting local villages, night walks in the jungle, and so much more. Surrounded by rainforest and noises from the wild, this is one place guests can immerse themselves in a real jungle experience. The staff go out of their way to try and meet guest’s expectations and make it a trip of a lifetime. 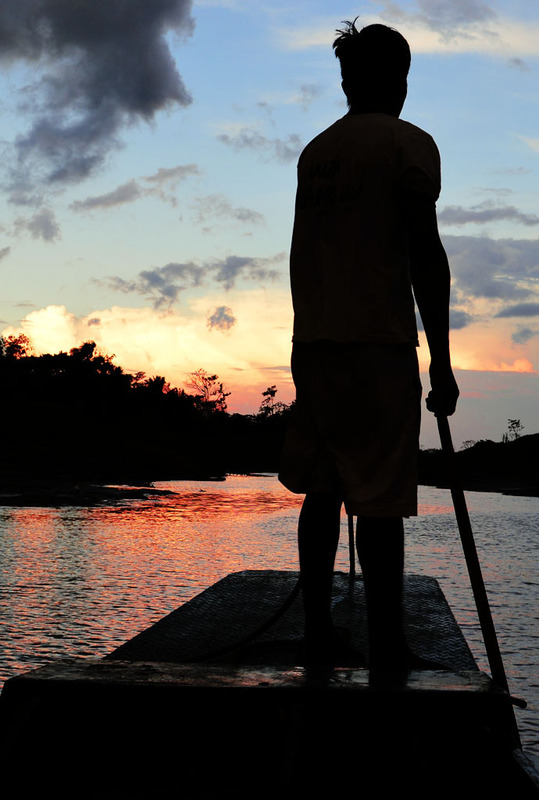 When we depart the lodge Eduardo runs along the river bank chasing our boat for as far as he can. We don’t want to leave and wish we were staying for longer. Our four days at Yarapa River Lodge were entertaining and moving, and we feel privileged to have spent time here with the monkeys and other wildlife. We only had an overnight in Iquitos but it looks like an interesting city and we would love to come back one day and explore it more. There are some great day trips from Iquitos. 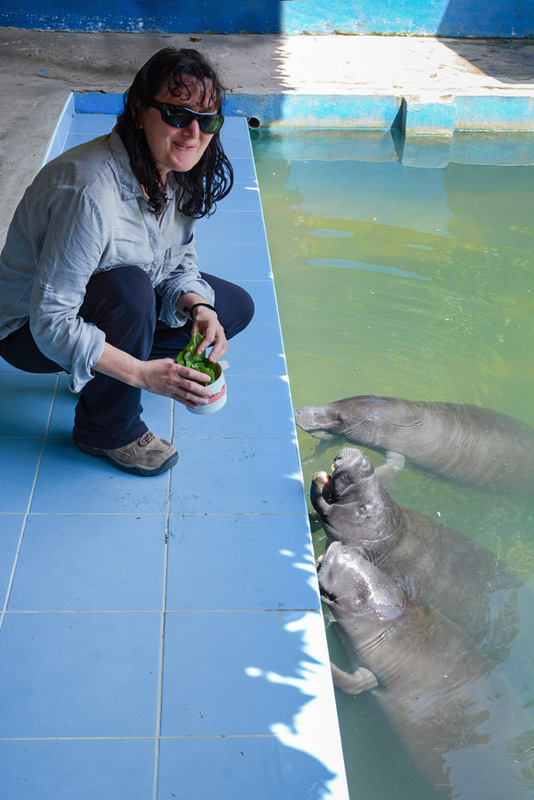 The Manatee Rescue Centre where orphan manatees are rehabilitated and introduced back into the wild. If very young manatees are in care at the time visitors can bottle feed them and feed the older ones water lettuce. Pilpintuwasi Butterfly Farm and Animal Rescue Centre – Great informative tour on the butterflies with tours that show their life cycle including their eggs and cocoons. The star of the show here is the awesome Owl Butterfly which has big yellow eyes to make him look like an owl and scare away predators. La Isla de los Monos/ The Monkey Island – Injured, orphaned and captured monkeys are cared for, rehabilitated and returned to the wild. 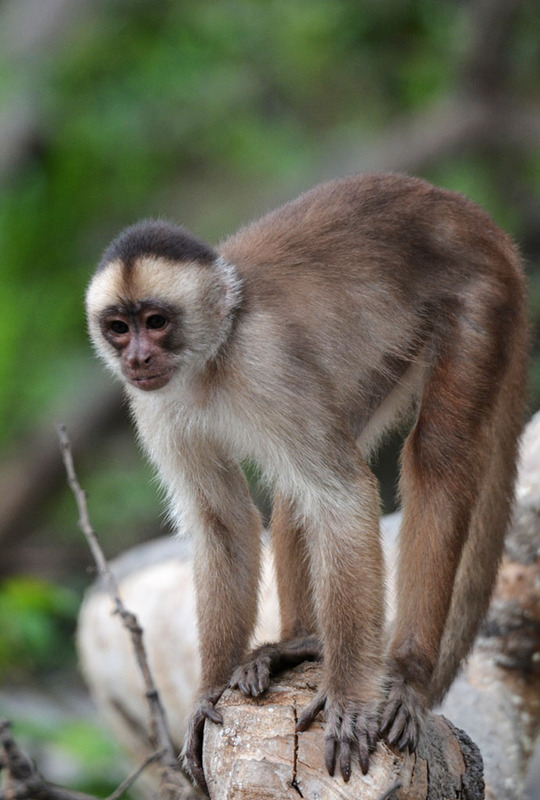 The monkeys are free roaming and visitors can mingle freely with them. While in Iquitos we stay at the Dorado Isabel Hotel which is near the main square, Plaza de Armas and the historic cathedral. On the Yarapa River the birdlife is immense and is a bird lover’s utopia. Vegetarian food in Iquitos is scarce, but we found this gorgeous little café a little further up from the hotel, closer to the main square. 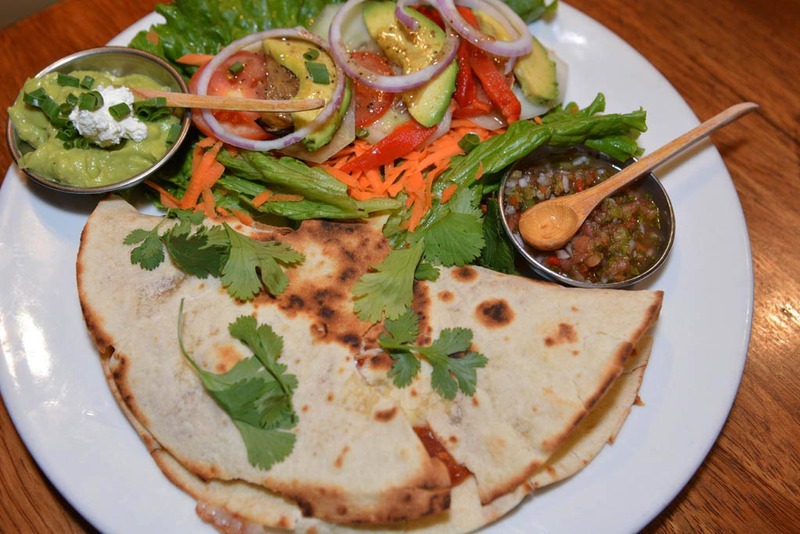 Karma Café has lots of delicious vegetarian options. We just love the bean and cheese tortillas and the carafes of sangria with fresh fruit. Sue, Thanks so much for all the information! So season seems like a non-issue but personally I’d definitely want to avoid summer. I certainly know whom to ask when we do plan our trip :o) Great advice! Once again you make it so real and makes one want too pack a bag and take off.